I am grateful and feel my spirits lift each day when I pull into the parking lot at the library and see the beautiful handiwork of the Raymond Beautification Committee. The Committee installs flowering annuals in flower boxes and the barrel under the library sign in May and maintains them on a weekly basis through the season into late fall. They change out the spring plants for fall mums in October, and end the season with festive holiday greens in the barrel under the sign and plant a few spring flowering bulbs in the fall for color early in the year as soon as the snow has melted. And that is just at the library. If you look up and down 302 in Raymond you will see other beautiful results of their dedicated work. Over the next couple of weeks the Raymond Beautification Committee, in collaboration with the Raymond Revitalization Committee, hopes to raise over $1,800 to fund 70 3-foot diameter wreaths for the ornamental light poles on Raymond's Route 302 corridor. Currently members of the RBC are visiting all the Raymond business people on Route 302 to personally request contributions, but also hope individuals, who will enjoy the wreaths as they drive along the corridor, will consider supporting the project. Wreath donations can be made to: Town of Raymond, 401 Webbs Mills Road, Raymond, ME 04071, with a memo saying "for Beautification Committee." Any amount is very much appreciated! On Sunday, December 6, from 1 p.m. to 4 p.m. decorate the season with a whimsical woven bell. Bring your bucket, scissors, old towel, awl, clothespins, pencil, measuring tape and packing tool, if you have them and make one bell at the library and take materials home to make another. The fee is $20. Space is limited so call 655-4283 to reserve your spot. Payment must be made upon registration. Deborah Gideon, a Raymond resident will be presenting Winter Health with Bees and Herbs on December 9 at 6:30 p.m. She will share her knowledge and experience of healthy home remedies just in time for winter. Join us to learn about herbs and honeybee products that can keep you healthy during the cold and flu season. You'll sample some delicious "medicine" and take home some recipes to make your own remedies. This program is free to the public. Please call the library at 655-4283 to reserve your spot. Question from Paula Pock: I have a question for Sara Moore Enlightened Horizons: My dog Baxter- (tan colored terrier mix), was injured months ago after chasing the neighbor's dog across the street. He has been checked multiple times by the vet and they give him the O.K, but he continues to whine when moving and is not able move like he used to. My question is: Are you still experiencing pain from the injury? If so, where? Thank you for your question about Baxter. I don't get a lot of pain, but I do have a strange feeling at the very base of my esophagus. I'm not a vet, so I don't have any medical experience, but he's saying it would be like having a slightly paralyzed diaphragm. I want to take a deep breath, but when I do it feels like my belly is already somewhat full of air. Is it painful? No. It feels like I have a full belly and am trying to make it deflate a little. After he tells you this, I get this huge smile on my face. I see him kissing your lips and you not minding it. He says you know it's love because you don't normally let animals do this to you. It's a very loving gesture! If she had to make another bow tonight, she might just lose her mind. Sophie expertly tied another bow with floral wire and set it aside. She had to go home. Had to stop the madness. She looked around her little floral shop and smiled. It was warm and homey with the white twinkle lights and floral arrangements all around the room. She didn’t care that it was Thanksgiving Day and she should be home baking or doing something for her family’s big celebration. Thanksgiving got lost in the shuffle of the Christmas rush for Sophie. The clock on the wall chimed three in the afternoon and she stretched her arms and rolled her head to stretch her neck muscles. One more bow and she’d head home to bake. She tossed the finished bow onto the pile, put on her winter coat that she really didn’t need, since it was still warm despite it being November in Maine and headed home. She flicked off the lights, closed and locked the door and climbed into her very used hatchback car that read The Enchanted Florist on the side. It was just getting dark as she pulled into the driveway leading to her small house on Raymond Pond. She took the corner and jammed on the brakes. There was a truck in the driveway and a man standing on a ladder his arms reaching above his head, a swatch of tan skin was exposed where his black T-shirt and his jeans didn’t meet. She hadn’t scheduled any maintenance and who knew what this guy was doing to her roof. Putting the car in gear, she rolled forward making sure to block his truck so that if he was trying to break into her house, he wouldn’t get away without a fight. He turned to look when she turned off the engine. Tucking something under her eves, he brushed his hands together and started down the ladder. “Excuse me,” Sophie said. “What are you doing to my house?” As she walked closer she could see exactly what he’d been doing. Around each window, the door and along the outline of the house, his man had put colored Christmas lights. His voice was like silk and she felt her irritation grow that he thought because he was good looking and sounded like a young Sean Connery that he could mess with her house. “Yes. Let me see that. Who hired you?” She hurried over to where he was standing and pulled the paper out of his hand. He was right. “The address is right, but there is still a mistake. I don’t do Christmas. Not here anyway,” she told the man. He shook his head. She got a good look at him. He was maybe in his late thirties, military cut hair and tan. His muscles bulged under his shirt and she wondered for a second if he was here for another reason other than putting up lights. “I’ll have to talk to the boss about this. I can’t just take them down because you said to. I have no proof that you actually live here.” He cocked his head to the side. “I’d like to finish what’s left. I won’t bother you,” he said, his voice back to the melty sound meant to seduce her into doing what he wanted. “Fine. Do what you need to do tonight.” Shoot. It worked. He was staying. She moved her car and went inside. She cracked open three containers of Grands biscuits plopped them on a cookie sheet and threw them in the oven that was not preheated. She toed off her shoes and went upstairs to change into clothes that would satisfy her mother, whom she loved, but didn’t always live up to her standards. She loved living where she did. Her view from her bedroom was the lake and her neighbors didn’t have the right angle see in. She didn’t even have shades on her windows. As she started to pull off her shirt she looked out at the lake, but saw a man instead. She shrieked, then ran to the window, threw it open and glared at him. “Obviously, I’m not,” she retorted. The holidays are upon us with Thanksgiving kicking off this week which, for many, means the start of the holiday shopping season. Black Friday is the notable start of the holiday shopping season, with many deals and bargains to reel customers in as early as 12 p.m. on Thanksgiving Day. Some people choose not to partake in this occasion, as it means waking up in the wee hours of the morning just to fight off crowds to maybe get the one item they set out to purchase…as well as interfering with family time and relaxation. The brave souls who do intend to shop, may see it as an opportunity to take advantage of some great bargains, as well as the idea of tradition in many families. Windham is no stranger to the idea of Black Friday and many local stores are participating. Most stores here in Windham will be closed on Thanksgiving Day and opening early Friday morning. Sears in Windham will be opening at 12:01a.m. for early morning shoppers to take advantage of their many Doorbusters and hot buy sale items. U.S. Cellular is having a four hour sale beginning at 8:00 a.m. and is offering an incredible deal on devices. Bull Moose will be opening at 6 a.m. on Friday morning and will have great deals on popular new releases such as $5 DVDs and $30 video games. Walmart opens at 12:01a.m. on Friday and will have 50 percent off deals throughout the store on electronics, toys, etc. Sears opens at 12:01a.m. as well. Lowe’s will open at 5 a.m. on Friday morning and is scheduled to have 40 percent off major appliances such as refrigerators, washing machines and dish washers. Radio Shack is one of the few stores that is open on Thanksgiving, with hours of 8 a.m. to 1 p.m. They have many good deals on headphones, headsets, and electronic toys. Marshalls, a popular discount clothing store here in Windham, will remain closed on Thanksgiving and will re-open during regular business hours on Friday. Other local businesses offering Black Friday deals are Sedona Wellness and Creativity Center in Raymond, PNF in Windham and Bonny Eagle Jewelers in Standish. If you, or your family, are looking to take advantage of some Black Friday deals this week, consider stopping by these local stores instead of heading to the crowded and hectic Maine Mall area. Not only will these shops, most likely, be less busy, but they will also offer the same deals as those in Portland. No matter where you choose to shop, be mindful of the other shoppers around you and the employees who are working hard to provide these deals. Stay hydrated, get some rest before you head out, and be patient…Black Friday can bring out the crazy in people so make sure to go in with a level head! 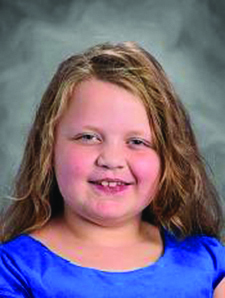 The Windham Eagle student of the week is 7.5-year-old Molly Nielson from Windham Primary School. She is in Mrs. Jenny Hopkins class and even though she’s in the primary school, she is planning on attending college. Molly lives with her mom and dad and a cat named Fisgig. She likes to sing, dance, cheer, watch movies and do art. Art and music are her favorite classes. “Molly is a very involved student. She cheers at football games. She dances. She follows the primary school rules. She makes others happy with her words, actions and attitude. In her free time, Molly likes to play outside and she likes to do crafts. Favorite movie: All Barbie movies.